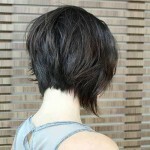 Dark and dramatic are the words that fall to mind for this pixie haircut on black hair. The contrast between the dark hair and skin-colour emphasises a perfect complexion and the frosted pink lip-colour keeps it casual for day-time. As always, short haircuts bring lots of attention to your eyes, so you can add a little extra eye-makeup without looking ‘overdone’! This version of the pixie-short haircut has been styled up in tousled spikes above the forehead and this is a great way to add length to a round face, along with the flat sides. Short side-points end just at the perfect place to accentuate the cheekbones, too. Another trick to keep the focus on your eyes is to wear a pair of stud earrings as this creates a ‘zone’ of interest between the earrings and the hairline above. For example, if you want to direct attention away from a slight ‘double-chin’, as few of us can boast such a well-defined jawline as the one shown here!